The giant Bovanenkovo field in Yamal will reach peak production in 2017 and several of the nearby fields are under development. The Bovanenkovo field will come into its annual target production of 115 billion cubic meters in 2017, company board member Oleg Aksyutin told Russian media. Subsequently, the rich nearby gas resources will be developed, Aksyutin added, neftegaz.ru reports. Bovanenkovo is with its 4,9 trillion cubic meters of reserves the biggest gas field in the Yamal Peninsula. It was taken into production in October 2012. The field resources are connected with the westbound Bovanenkovo-Ukhta pipeline and a new airport and railway line enables Gazprom and its regional subsidiaries to bring in both manpower and goods. The nearby Kharasaveyskoye and Kruzenshternskoye both hold an estimated 3,3 trillion cubic meters. The Kharasaveyskoye field is now due to come into production in year 2023, company representative Sergey Menshikov said, oilru.com reports with reference to Prime. That is five years behind the original time schedule. The Kruzenshternskoye is expected to be next in the line. General Director of exploration subsidiary Gazprom Geologorazvedka Aleksey Davidov confirms to TASS that a second exploration well was drilled on site in 2015 and that more activities are in the pipeline. According to Davidov, an artificial island could be built off the coast of Yamal in order to facilitate drilling and production at Kruzenshternskoye. Both the Kharasaveyskoye and Kruzenshternskoye are located partly onshore, partly offshore. 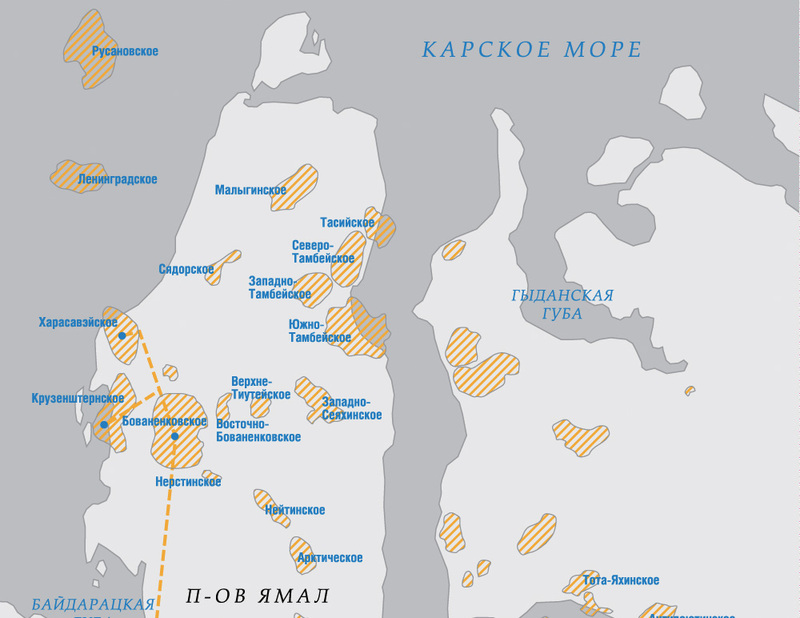 In addition, Gazprom holds licenses to several major gas resources in the nearby Kara Sea. Among them are the Leningradskoye and Ruslanovskoye. Davidov says to a Gazprom corporate journal that his company in 2015 conducted a record-big volume of 3D seismic operations in Arctic waters. A total of 9490 square kilometers was mapped he says, TASS reports.